Please note: As of January 1, 2014, sales of ECG related equipment (SECG, MECG, CMRR, ECG set) are being handled by Whaleteq in Taiwan. Please contact Mr. Nathan Lin for pricing and delivery schedule (nathan.lin@whaleteq.com). This page is retained for reference only. 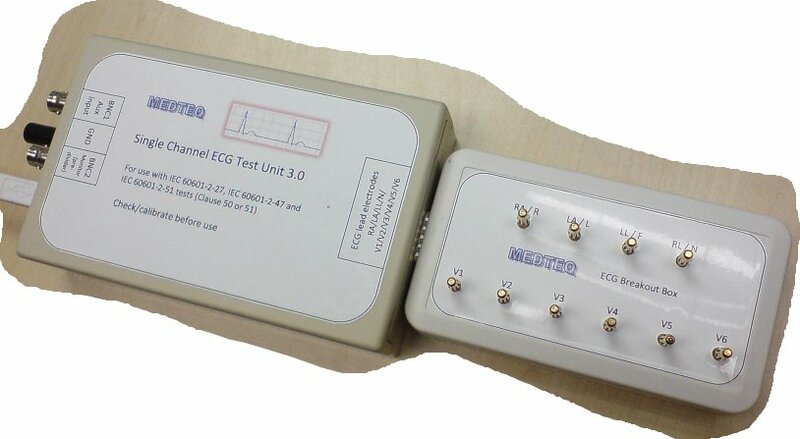 ECG related standards contain a range of "single channel" tests, such as sensitivity, frequency response, input impedance and pacemaker rejection. MEDTEQ test equipment is custom designed for the tests described in IEC 60601-2-25, IEC 60601-2-27 and IEC 60601-2-47 . 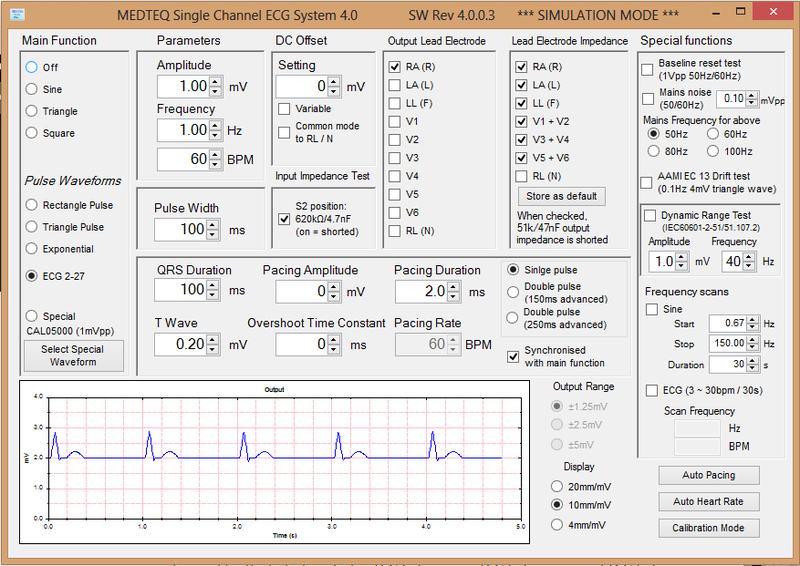 MEDTEQ's Single Channel ECG test system comprises of a USB powered Test Unit incorporating microprocessor control, precision electronics and a network of output relays, together with PC software to make testing simple as clicking a few buttons. Waveform data is continuously streamed to the test unit, accessing the full power of PC processing to create anything from a simple rectangular pulse to complex ECG waveforms with pacing spikes and exponential overshoots. A real time graphical display lets the user see the waveforms being applied during the test and compare to the results in the equipment under test. The latest revision 4.0 has been updated to the latest 2011 and 2012 editions of the ECG standards. All the tests described in IEC 60601-2-25 Clause 201.12.4 are covered except for those using CAL/ANE waveforms (most of these are optional, if required use the MEDTEQ MECG for this), and the CMRR test (use the MEDTEQ CMRR box for this). All tests in IEC 60601-2-27 Clause 201.12 and IEC 60601-2-47 Clause 201.12.4 are covered, except for CMRR tests again. The internal circuit is based on IEC 60601-2-25, Clause 201.106, which is now harmonized for use in IEC 60601-2-27, IEC 60601-2-47 and the ANSI/AAMI ECG standards like EC13. Special test waveforms for ANSI/AAMI EC 13 have also been added. Refer to the Test Equipment overview page for links to documents (e.g. operation manual, system validation, calibration form) and pricing. Reduced priced units are avalibale (3 or 5 lead outputs, without ECG breakout box).